Milwaukee’s City Hall was designed by architect Henry Koch in the Flemish Renaissance style and was dedicated December 23, 1895. Made of over 8 million bricks, it was one of the tallest buildings in the world when it was completed. 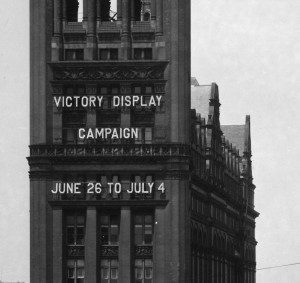 In 1906, a lighted message system was added to the south side of the tower facing the intersections of Wells, Water, and Market Streets. It was installed by City Electrician David McKeith and consisted of wood letters that were forty-two inches tall, painted white to stand out against the terra cotta building, and lit with fifteen twenty-five watt bulbs. Behind the sign was a catwalk so that workers could easily change the letters. Messages were rotated depending on events taking place in Milwaukee. 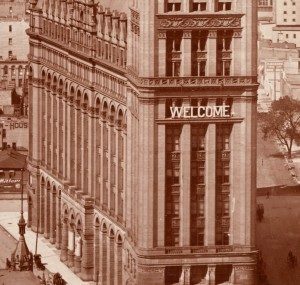 It generally read “WELCOME” and often included organizations that were holding conventions in the city. Other messages included congratulations for sports teams, support for soldiers fighting in World War I and II, national and local anniversaries and celebrations, and various other things of note. The letters developed a widespread reputation and were even featured in the opening credits of the Laverne & Shirley television show. In 1988, Mayor John O. Norquist and the Historic Preservation Commission dismantled the framework and stopped using the letters, citing the increased costs of maintenance. City Hall gave the letters to the Milwaukee Institute of Art and Design (MIAD) where they were put in storage. In 2012, MIAD chose to give the letters to the Milwaukee County Historical Society. MCHS now has over one hundred of the original letters, some of which will be restored and made operational. Currently, the letters “M-K-E” are restored and hang in the main atrium at the Historical Society. make them operational again the Society will repair them as funds become available. Donations are being accepted towards the restoration of letters which will be completed as funds become available.